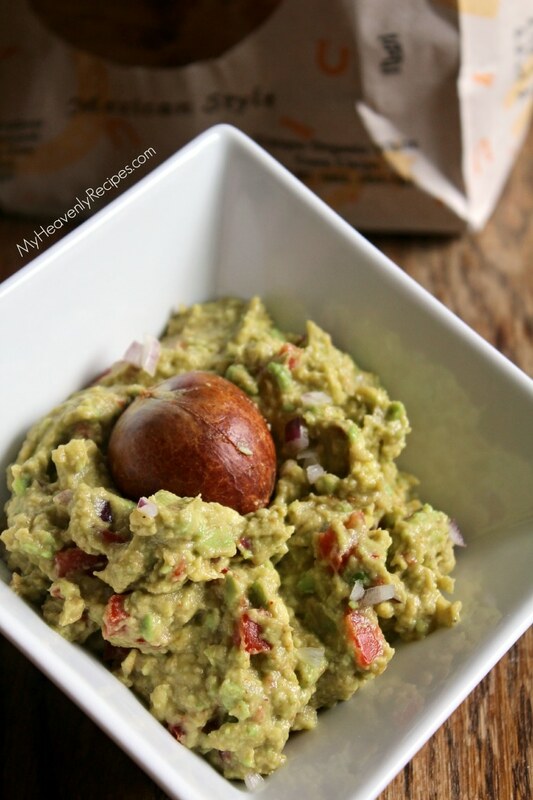 You will LOVE this SIMPLE GUACAMOLE RECIPE! 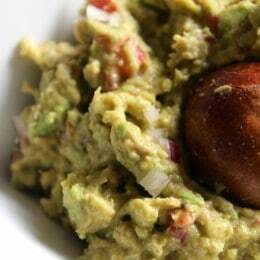 This homemade guacamole is packed full of flavor and it’s so easy to make. You can’t forget about the lime juice, just please promise me, you won’t forget the lime juice when you make this recipe! It’s all about the lime juice! If you have never had guacamole or avocados, you need to stop what you are doing, head to the store and grab some ripe avocados. You want avocados that are just a tad squishy to the touch. It took me YEARS to get the courage to try avocados and I am so sad that I waited for so long. In fact, all three kids love avocados and guacamole! We like to make Egg and Sausage Stuffed Avocados for breakfast and I have a fantastic avocado salad dressing recipe, too. When shopping for an avocado, pick the ones that are just a tiny bit squishy for guacamole. You want the avocado to stand up to the ingredients you are about to put in. You don’t want super soft guacamole or you’ll lose texture. When mashing, you want chunks. Don’t go forkin’ around and try to get a smooth guacamole people! The texture is everything! When cutting your tomato, remove the seeds. You don’t want any water or “runniness” in your homemade guacamole. Choose a red onion. White onion will do, but, it just overpowers the guacamole and the flavorings. 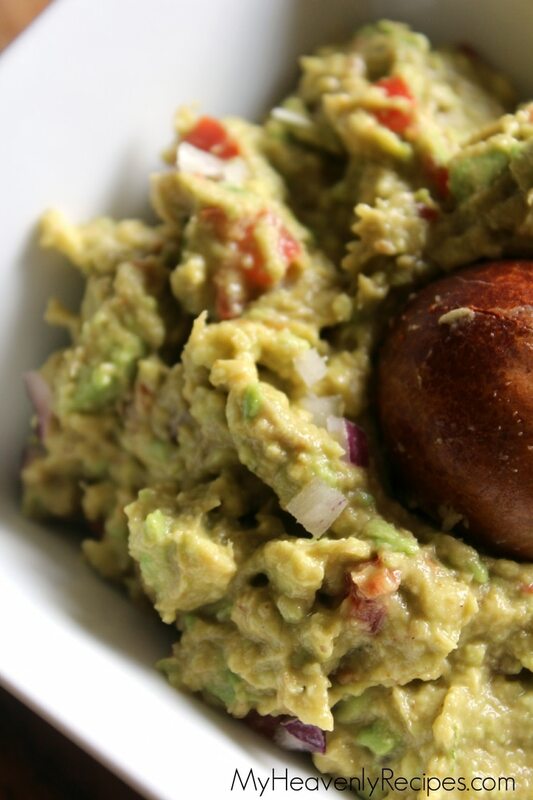 So always use red onion for this simple guacamole recipe! It’s all about the seasonings. Don’t leave out the lime juice, salt or cumin. If you like a little heat in your guacamole, add a pinch or two of red cayenne pepper! Nobody wants to eat brown guacamole. It kinda just kills the mood, ya know? Tip #1: The lime juice, the acidity in the lime helps to keep the avocado green! Tip #2: Put the pit back in! The avocado is housed with the pit, which helps it not to turn brown. Tip #3: Seal your guacamole. The avocado is sealed and has the pit to help it keep browning. Remove all the air before storing to help to prevent browning. Tip #4: A reader once told me this, but, I’ve not tried it yet. She mentioned putting olive oil on plastic wrap and then ensuring the olive oil is touching the guacamole before sealing. If you have a tip for keeping guacamole from turning brown, leave a comment below! We love tips! 1. In a large bowl empty both avocados and mash with a fork. 2. Add in diced tomatoes, red onion, cumin, and salt. 4. If you are looking for a little heat from your guacamole add a dash or two of cayenne pepper and stir. You will LOVE this SIMPLE GUACAMOLE RECIPE! This homemade guacamole is packed full of flavor and it's so easy to make. In a large bowl empty both avocados and mash with a fork. Add in diced tomatoes, red onion, cumin and salt. If you are looking for a little heat from your guacamole add a dash or two of cayenne pepper and stir.